(1)P The design of earthquake resistant concrete buildings shall provide the structure with an adequate capacity to dissipate energy without substantial reduction of its overall resistance against horizontal and vertical loading. To this end, the requirements and criteria of Section 2 apply. In the seismic design situation adequate resistance of all structural elements shall be provided, and non-linear deformation demands in critical regions should be commensurate with the overall ductility assumed in calculations. (2)P Concrete buildings may alternatively be designed for low dissipation capacity and low ductility, by applying only the rules of EN 1992-1-1:2004 for the seismic design situation, and neglecting the specific provisions given in this section, provided the requirements set forth in 5.3 are met. For buildings which are not base-isolated (see Section 10), design with this alternative, termed ductility class L (low), is recommended only in low seismicity cases (see 3.2.1(4)). (3)P Earthquake resistant concrete buildings other than those to which (2)P of this subclause applies, shall be designed to provide energy dissipation capacity and an overall ductile behaviour. Overall ductile behaviour is ensured if the ductility demand involves globally a large volume of the structure spread to different elements and locations of all its storeys. 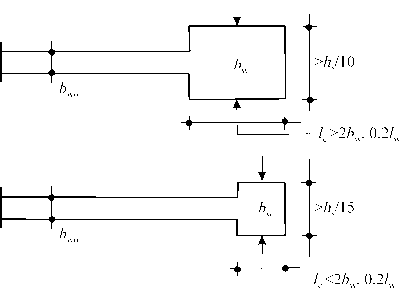 To this end ductile modes of failure (e.g. flexure) should precede brittle failure modes (e.g. shear) with sufficient reliability. (4)P Concrete buildings designed in accordance with (3)P of this subclause, are classified in two ductility classes DCM (medium ductility) and DCH (high ductility), depending on their hysteretic dissipation capacity. Both classes correspond to buildings designed, dimensioned and detailed in accordance with specific earthquake resistant provisions, enabling the structure to develop stable mechanisms associated with large dissipation of hysteretic energy under repeated reversed loading, without suffering brittle failures. (5)P To provide the appropriate amount of ductility in ductility classes M and H , specific provisions for all structural elements shall be satisfied in each class (see 5.4 -5.6). In correspondence with the different available ductility in the two ductility classes, different values of the behaviour factor q are used for each class (see 5.2.2.2). NOTE Geographical limitations on the use of ductility classes M and H may be found in the relevant National Annex.